June 22 2015 marks the 27th Anniversary of Who Framed Roger Rabbit. This Storybook series pin released in 2007 features the cartoon cast of the movie. 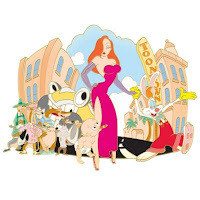 All of The Weasles of the Toon Patrol, Benny the Cab, Baby Herman, Jessica and Roger Rabbit celebrate in the backdrop of Toontown.